Nissan's relaunched bargain brand Datsun is already expanding. The five door GO supermini is being joined by a new seven-seater people carrier, called the GO+. There are no plans to import the new models to Europe at the moment, with sales currently limited to Indonesia. The comeback kid will build its new hatchbacks and people carriers at Nissan's plant in Purwakarta in Indonesia. Nissan relaunched the Datsun marque in July, last seen in the UK in 1983, as its new budget brand for developing markets. The GO+ has been unveiled in Jakarta, and features flexible seating for seven in an MPV that's powered by a 1.2-litre petrol engine. Nissan hasn't confirmed details of its expansion plans for its Datsun brand, but confidently expects these well priced cars (which start at around £5000) to account for up to 50 per cent of its sales in Indonesia within three years. 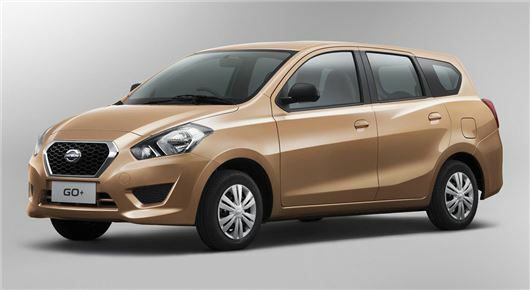 Future markets for Datsun will include India, Russia and South Africa in 2014 - although European sales are unlikely given the model overlap with fellow Nissan-Renault budget brand, Dacia.